If one wants to know how bad the health of China's economy has gone, look no further than PBOC's composure, which seems rather frustrated and aggressive as of late. On 5th July, the central bank cut benchmark interest rates for the 2nd time in less than a month. This happened right after the fact that in December 2011, PBOC cut the reserve requirement ratio(RRR) by a 50 bp to 21%, it followed up with another 50 bp in February and another 50 bp in May to 20% currently. On top of all the rate cuts, PBOC also made its biggest injection of funds into the money market in nearly six months. PBOC injected a net 225 billion yuan ($34.5 billion) through the reverse-repurchase operations(repo) on last Tuesday and Friday, following a combined injection of 291 billion yuan in the previous four weeks. The main drivers of China's debt financing,China's state-owned banks, are starving for cash. According to Citigroup estimates, in 2011 seven of the biggest Chinese banks raised 323.8 billion renminbi ($51.4 billion) of new funds. Several financial firms are expected to raise another $17.7 billion in the next few months, with China’s fifth-biggest lender, the Bank of Communications, accounting for $9 billion. The unprecedented lending binge encouraged by the central government,increasingly rigorous requirement of regulatory capital and excruciating continuance of excessive dividend payouts have rendered the most-profitable banks in the world--Chinese banks--in a rather precarious position.GaveKal's data will illustrate this is no exaggeration: In 2010, China’s five biggest banks — the Big Four plus the Bank of Communications — paid more than 144 billion yuan in dividends while raising more than 199 billion yuan on the capital markets. The ballooning balance sheet driven by the loan frenzy and strict capital requirement make China's banks' cash-craving burning at both ends:this march, China’s big four— Industrial and Commercial Bank of China, the Bank of China, China Construction Bank and Agricultural Bank of China — have a combined 14 percent increase in total assets, to 51.3 trillion yuan, which is roughly the size of the German, French and British economies combined. Meanwhile, under a new set of rules, the country’s biggest banks will need to increase their capital levels to 11.5 percent of assets by the end of 2013.Their core Tier 1 capital ratio will need to be at least 9.5 percent. These requirements are more stringent than the rules applied to American and European banks. Hereby, we shouldn't be surprised why the world's most profitable banks are in the dire need of cash. It has to be PBOC who comes to the rescue. But we can't expect the alchemy of central banking to conjure miracles other than administrating monetary band aids when the economy is broken. 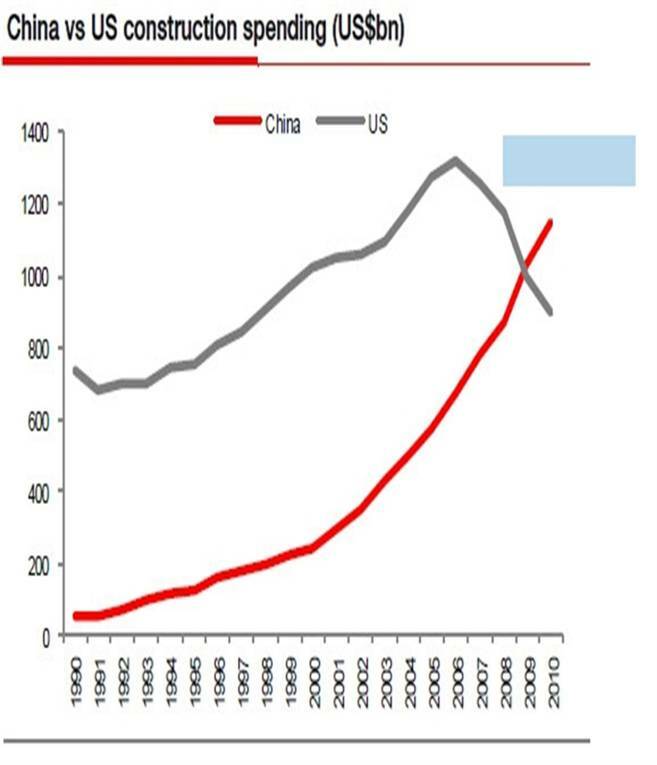 According to the great Ray Dalio's principles, the credit-fueled China's economy is so over-leveraged that a great de-leveraging is going to be the only way out. The pyramid of debt/credit is cracking and will collapse since the conditions of underlying economic agents are deteriorating.There's no mount of monetary band aids that can alter that destiny. 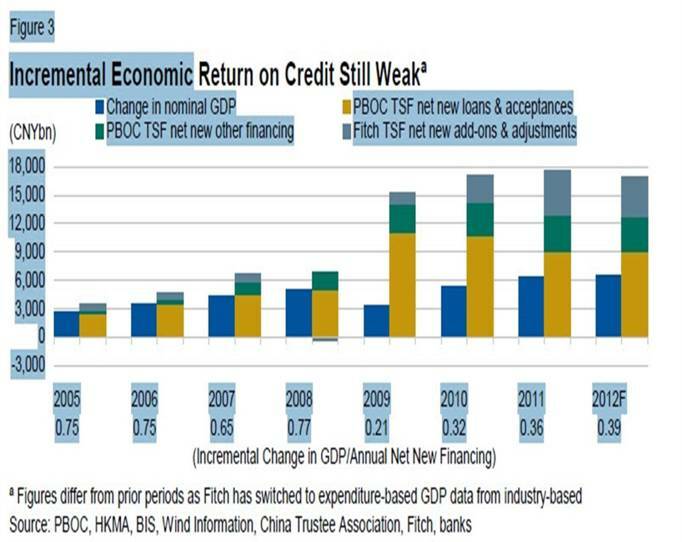 According to Fitch’s data, the ratio of total financing/GDP in China rose from 124% at end‐2007 to 174% at end‐2010, and rose by another 5pp to 179% in 2011.In 2012 the growth of broad credit will slightly decelerate but still outpace GDP. 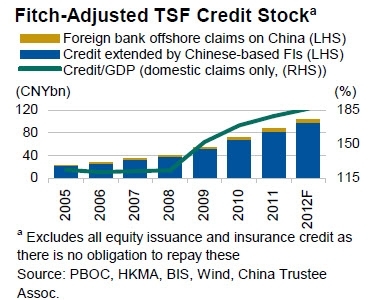 Clearly China is not suffering a liquidity crisis but the diminishing economic return on credit. 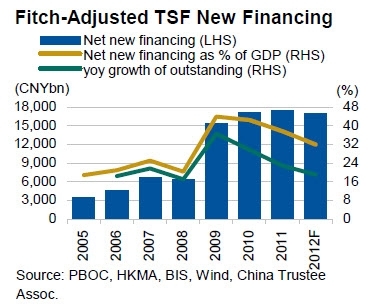 According to Fitch, in 2012, each CNY1 in new financing will yield ￥0.39 yuan in new GDP versus ￥0.73 yuan pre-crisis.Returns would have to rise above ￥0.5 yuan for domestic credit/GDP to stabilize at 2011’s 179%.The dilemma is that business entities will need more and more credit to achieve the same economic result, therefore will be more and more leveraged, less and less able to service the debt, more and more prone to insolvency and bankruptcy. It will reach a turning point when the increasing number of insolvencies and bankruptcies initiate an accelerating downward spiral for underling asset prices and drive up the non-performing loan ratio for the banks. And then the over-stretched banking system will implode. A full blown economic crisis will come in full force. The chain of reaction is clearly set in the motion now. The question is when we will reach that turning point. What PBOC has done is only adding fuel to the fire because it is unable to tackle the root causes of China's economic ills. The root causes are unsustainable economic bubbles and collapsing demand. Firstly, I will analysis China's construction industry to illustrate the severeness of China's economic bubbles. According to Société Générale,in 2010, China spent more than $1,000bn on construction (including residential/non residential real estate and infrastructure), representing around 20% of its nominal GDP,or almost twice the world average. In 2010 Chinese construction market surpassed that of the US and became the largest construction market worldwide with around 15% share. That year China's construction binge push its investment/GDP ratio to 48.5%, a record unprecedented in the recent history of China or any other major economy. It's sufficient to say China is a construction-led economy. In 2010, China’s cement consumption surpassed 1,800mt, which is around 55% of global consumption and about 25 times more than US consumption. With average consumption of 1,400kg per capita, China stands well above the world average ex-China of 300kg. History shows that such high consumption is hard to sustain for a number of years and ultimately leads to a construction crisis sooner or later. In 2010, China has built around 1.8bn square meters of new residential floor space, which is the equivalent of Spain’s housing floor space stock. This construction has already provided accommodation for 60 million people while the urban population has merely increased by c. 20 million. 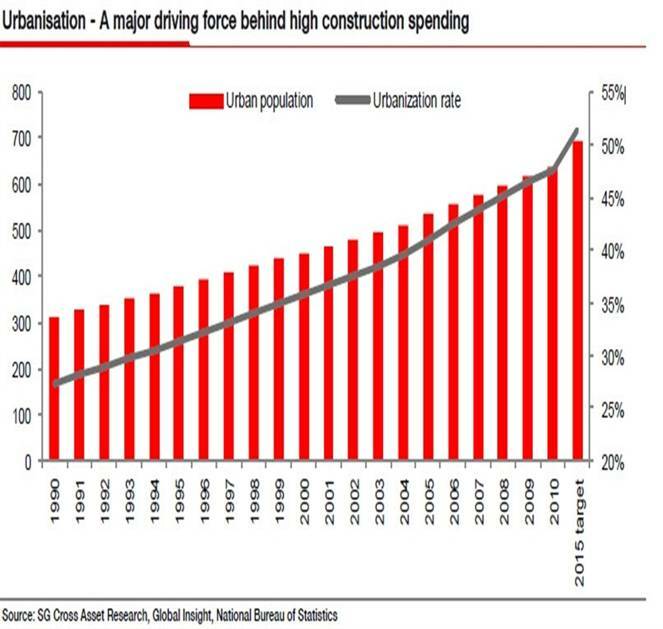 If China were to keep its current construction pace over the next five years, the 9bn sqm new housing area built would provide accommodation for 300 million more people by 2015. Therefore the available floor space stock in China will then be able to accommodate an urbanization rate of 65-70%.But according to IMF's forecast, it won't be until 2030 for China's urbanization to reach that level. How can the central government punish those farmers migrating ever so slowly to the cities? Obviously, China will have more and more cities like Ordos, a modern Chinese Ghost Town photogenically praised by the Time magazine. Still not convinced? 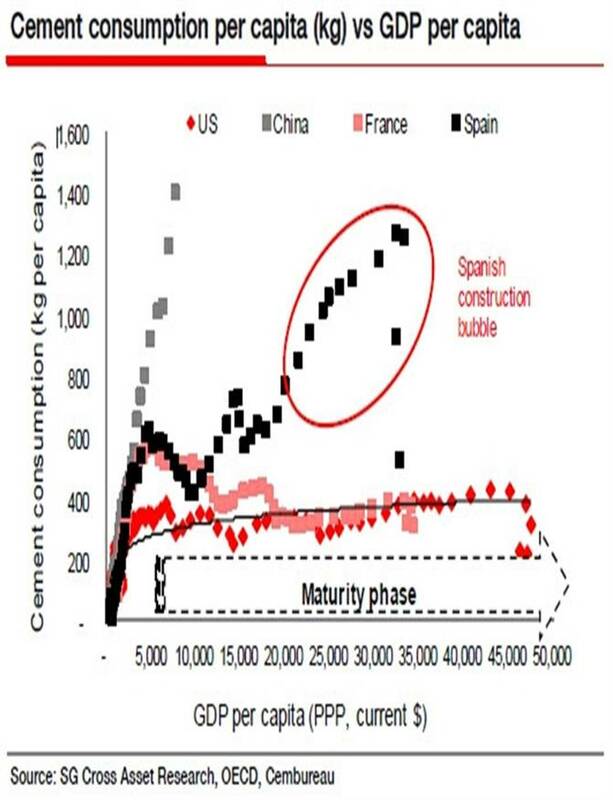 China can look to pre-crisis Spain for signs of construction bubbles. Spain had a very high consumption per capita for years before it crashed with the financial crisis. Spanish annual cement consumption topped off at nearly 1,300kg per capita in 2007, ahead of the financial crisis. 4 years later, Spanish consumption stands barely at around 500kg per capita, down 60% from its peak. If China's cement consumption per capita keeps its current momentum, sooner or later China's construction bubble will reach its end game. Economic bubbles are unsustainable. It works like a Ponzi scheme. When it first starts, the excess liquidity unleashed by the central banks will drive the asset prices higher and higher. There will be more and more people and money buying into the game assuming the price will keep going up. Back then the leverage is not a problem. But when the great de-leveraging is beckoned, there will be a stampede towards the exit. That's when any Ponzi scheme collapses. Let's make no bones about the fact that China's investment-fueled growth including the construction binge is just such a Ponzi scheme. To this stage, China can't reply on the excessive investment to propel its growth much longer. So what about seeking the growth more and more from the demand side of the economy: the foreign and domestic demand? Well, that path looks rather bumpy as well. As to the foreign demand, China's export growth clearly is decelerating recently as the major customers--EU and the US--are both fighting on the edge of double-dip. It is immoral to accelerate the export growth while trade partners are drowning in their debt crisis. It is also rather dangerous while those trade partners are fighting for their survival and won't hesitate to start a trade war to defend their lifelines. China can sincerely hope that EU and the US soon bounce back from the economic abyss to become their best customers again but that won't happen for a long time. I agree with Ray Dalio that this economic crisis is a great deleveraging, which will take more than a decade to unwind. According to UBS Wealth Management Research's report, the great deleveraging will likely play out through 2020. The ratios of debt-to-incomes must go down in EU and the US. Sorry, China, no more easy fuel for your export growth. Now that's too bad. 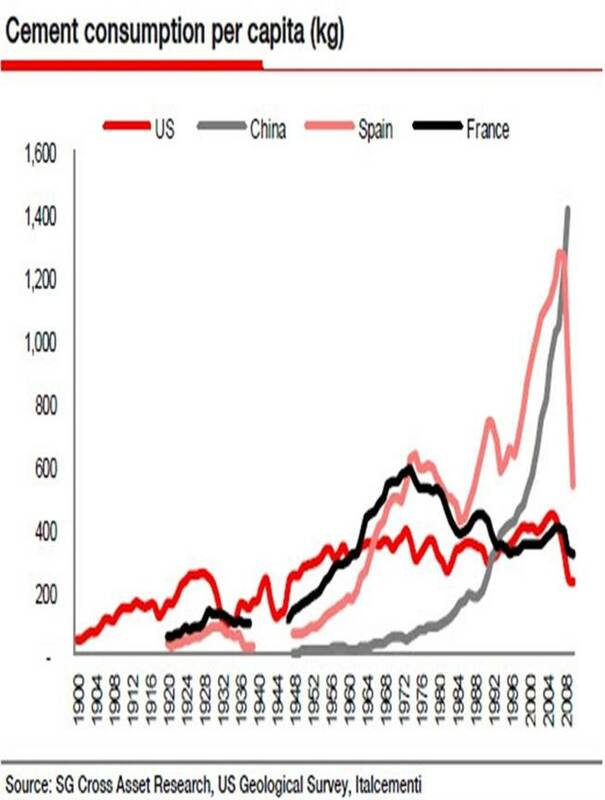 The Ponzi scheme of investment growth and the export growth are both collapsing. What's left for China to seek the growth then? 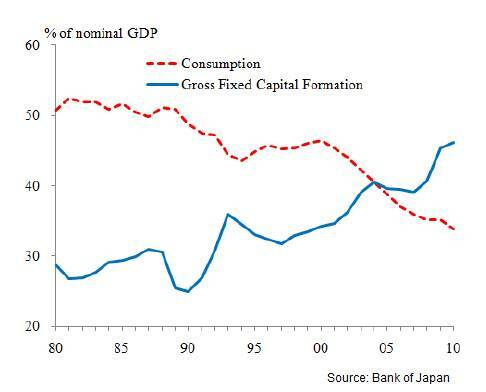 Domestic demand aka private consumption? It's much promised but not very convincing. 1st, Contrary to what many choose to believe, China's trade surplus is not caused by Chinese consumers' high saving rate, but has much to do with their deteriorating disposable incomes which far lag behind GDP growth and inflation. According to the All China Federation of Trade Unions (ACFTU), workers' wages/GDP ratio have gone down for 22 consecutive years since 1983. It goes without saying that the consumption/GDP ratio is shrinking all the while.Meanwhile, Aggregate Savings Rate has increased by 51% from 36% in 1996 to 51% in 2007. Don't jump to your conclusion yet that Chinese consumers has been over-tightening their purse strings. The truth is far away from conventional perceptions: according to Development Research Center of the State Council's report, that increase is mainly driven by the government and corporations and not by the household. For the past 11 years, Household Saving Rate has only increased from 19% to 22%. 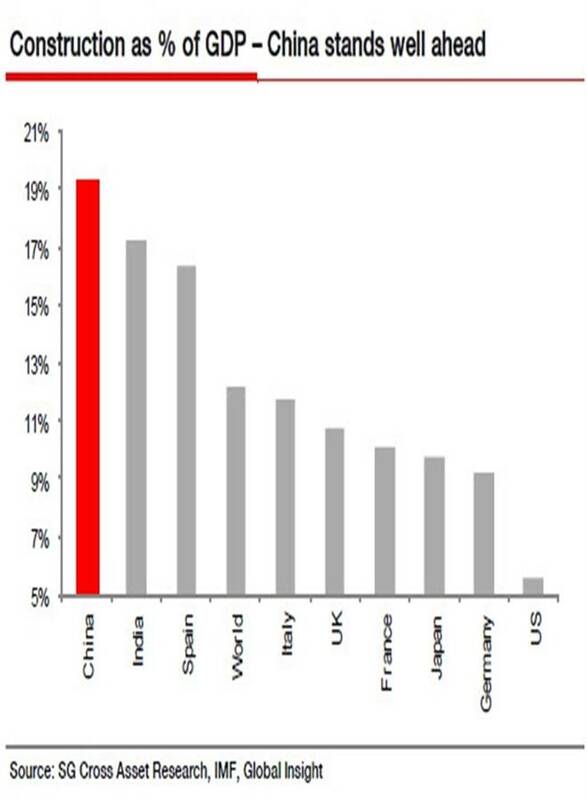 Even India's Household Saving Rate of 24% is higher than China's right now. All the while, government and corporations' saving rate has increased from 17% to 22%, which accounts for nearly 80% of the increase on Aggregate Savings Rate. For the past decade, Government's fiscal income is growing faster than GDP or Household Income. In 2009, the fiscal income was 687.71 billion yuan, and achieved an annual growth of 11.7% while GDP growth was 8.7%, Urban household disposable income growth was 8.8% and agriculture household disposable income growth was 8.2%. It is obvious that the state and corporations has taken too much out of national income and hence they continue to weaken the consumers rather than empower them. 2nd, The state enterprises and crony capitalists heavily dominate the income distribution. The deteriorating income inequity makes it harder for GDP growth to trickle down to the overall consumption. In 2010, the net profits from two central enterprises(China Mobile and Petrol China) outstrip the net profits from the top 500 private enterprise combined. Meanwhile, Central enterprises only contribute 30% of GDP, and provide 20% of national employment while the private enterprises contribute 70% of the GDP and provide 80% of the national employment. Adding fuel to the fire, monopoly enterprises also account for 55% of national wage and salary. The widening income gap will skew more and more national income towards corruption, rent seeking, capital flight, asset investment and speculation. Thus the consumption-side of economy will be continually weakened. The biggest problem for China is the state, central enterprises and crony capitalists wield too much power over national economy, have too much monopoly power over wealth creation and income distribution, and much of the GDP growth and vested interest groups' economic progress are made at the expanse of average consumers stuck in deteriorating relative poverty. If these problems aren't solved, the faster the Chinese GDP growth, the less Chinese consumers will be able to support the over-capacity expansion, the more export momentum China will need to sustain its growth. This is a vicious circle of global imbalance. Even the revaluation of RMB can't break it. There you have it: the unsustainable economic bubbles and collapsing demand are the root causes plaguing China's economy. PBOC's current maneuverers won't fix any of it. As I said previously,those alchemy recipes of central banking at best can serve to sustain the over-leveraged economy and avoid the systematic short-circuit of debt financing for now. Other than that, there won't be much liquidity invested in capacity and job intensive projects since there's no much demand to go around and the economic return on credit will deteriorate. If these structural deficiencies aren't properly addressed by the central government, things will get worse, more frivolous rate cuts and RRR cuts and other central banking's gimmicks are sure to come but to no avail, the chain reaction will be accelerated, and China will face its end game: the dark side of a great deleveraging.